When Ellie and I went to Florida earlier this summer, we took a rather relaxed approach. 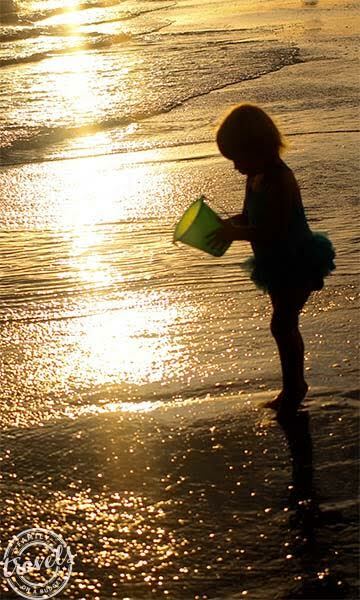 We tossed summer clothes, swimsuits and beach towels in a bag and headed off on our adventure. This is highly unusual for me. 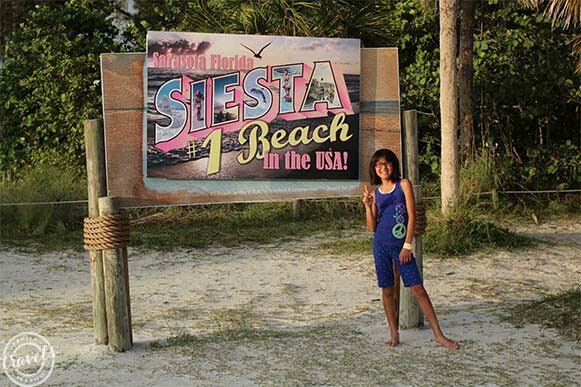 I usually research before I travel, but this was so last minute, I figured Florida + Sun + a kid on summer break = FUN! It really didn’t matter what we did. The first day, we hung out at the resort park, lounging at the pool, riding the waterslide and eating coconut cream pie. The second day involved more of the same, yes, even the coconut cream pie… until, of course, we decided to do something different. 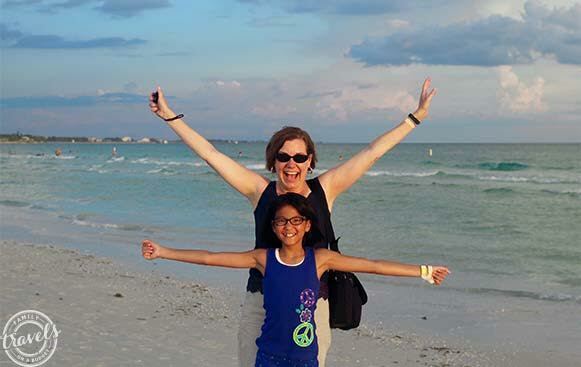 I asked, “Ellie, what should we do this afternoon?” Without missing a beat, she replied, “How about the beach?” So, I punched nearby beaches into my GPS and we drove off to Siesta Beach. Sometimes you get lucky “flying by the seat of your pants” as my grandma used to say. This was definitely one of those times. 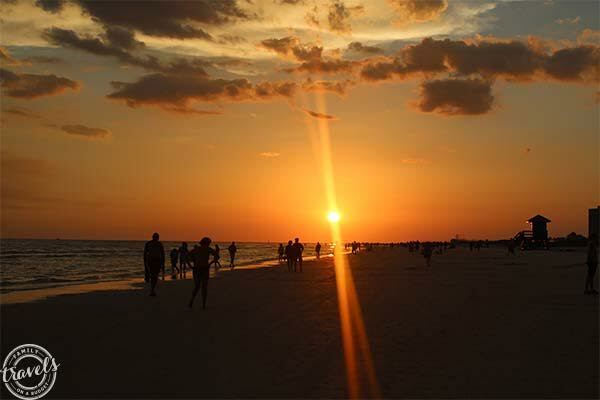 We pulled into the crowded parking lot at Siesta Beach, which honestly surprised me. Really, how popular can a beach be at 6 p.m. on a Tuesday? Isn’t that when most vacationers wrap it up and head home to get ready for dinner? 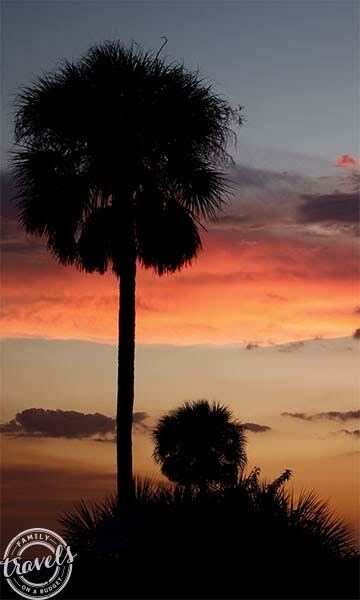 The beach has loads of grilling and picnic areas, a 2-story visitors’ center with reasonably clean restrooms, lots and lots of rinsing stations, a shaded children’s playground. That’s all before you even see the beach! The beach itself is AHHHHHH-mazing! I have been to loads of beaches from east to west, Hawaii, the Caribbean, Mexico and the gulf, and I’ve never felt sand like this! 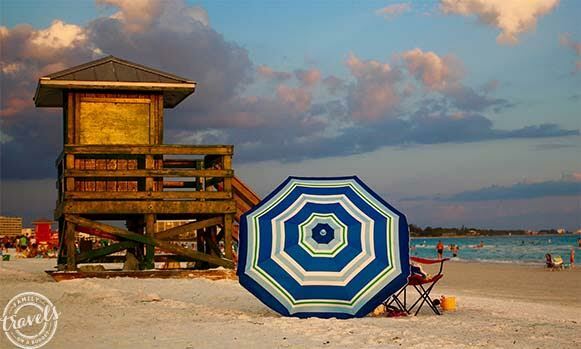 Made of 99% pure quartz, the sand at Siesta Beach is incredibly soft underfoot, and it stays cool! 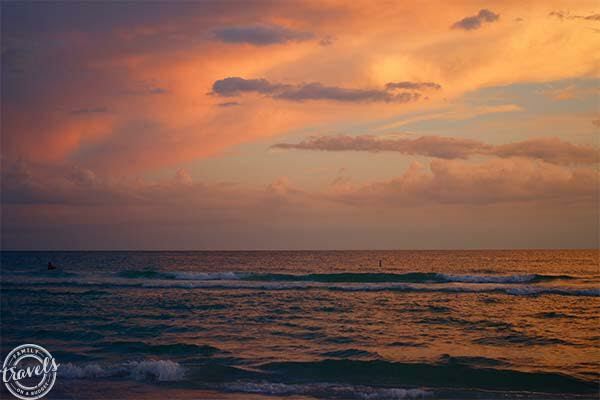 No wonder it was ranked the #1 beach in the United States in 2011 with a repeat in 2015! 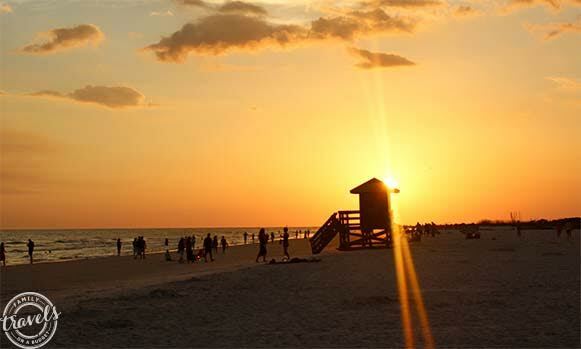 Besides the incredible sand, the beach offers sand volleyball, warm, gentle Gulf water and incredible sunsets. We saw a group of dance hula-hoopers practicing their craft, lots of people tossing footballs on wide, uncrowded sections of sand, and families enjoying picnic dinners. 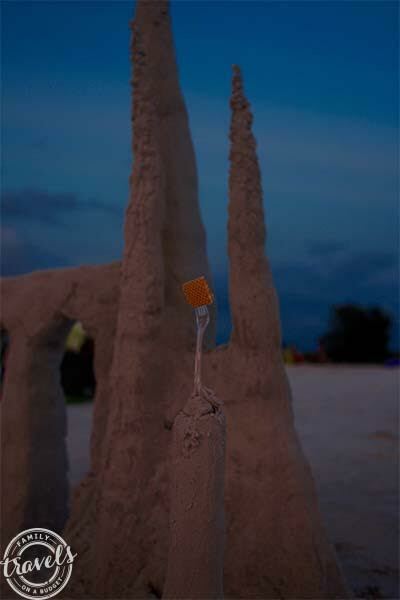 One family, there to celebrate mom’s birthday, spent hours building the sand castle in the title image above. 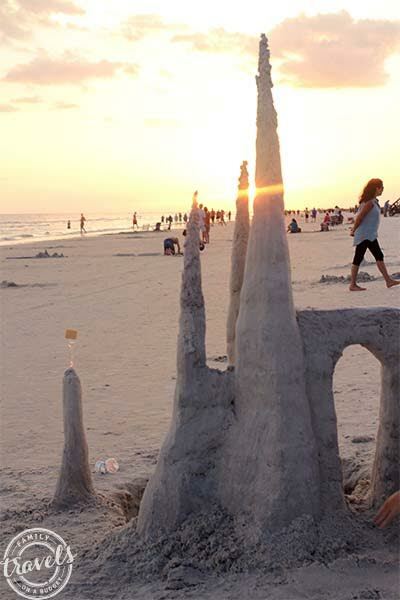 Alex and Jacob, brother creators of the sand castle, plan to enter the annual Sand Sculpture Contest this November! Throw in the adorably photogenic lifeguard stands and it can’t get more beautiful. Or can it? Remember my surprise at the packed parking lot? Well…. 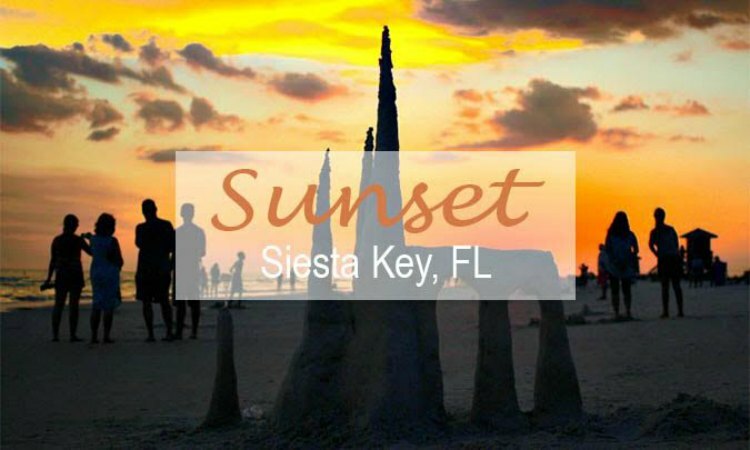 it turns out that those who do their research know that the Siesta Beach sunset is incredible! Sometimes, a spur of the moment choice is the best decision! P.S. If you happen to know Jacob and Alex, would you share this post with them. They live in Siesta Key somewhere but I lost their email address. Thanks!